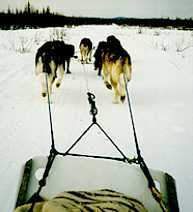 A special "thank you" to Tom & Cathy Dimon, Dimon Freight Dogs, North Pole, Alaska for sharing the photos of their Mackenzie River Huskies. Photos courtesy of Tom & Cathy Dimon, Dimon Freight Dogs. 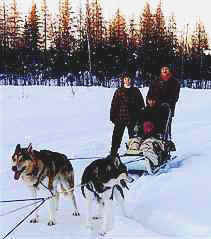 For more information on Dimons, read their interview on Meet a Musher! 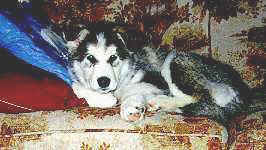 "We run large freighting dogs, ranging in weight from 70 pounds to 115 pounds. They run slow, but steady. We have been actively involved with weight pulling for the last 4 years, holding several offices in different clubs. " A view from the back of Dimon's team. "Weight pulling is a good chance to socialize the dogs and get out for a good time with friends. Winter camping and touring is a great way to relax and see the country side." "We run the dogs recreationally, mostly winter camping and touring, as a way to see spectacular scenery in the peaceful wintertime."